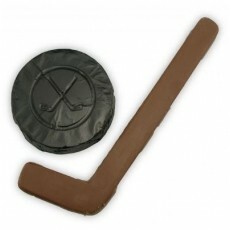 Score a goal with this hockey theme kit! 4.64 oz Clear cello bag filled with 1 chocolate hockey stick and 1 chocolate foil wrapped hockey puck. Mix and match chocolate flavors for no additional charge. Coordinate foil and ribbon colors to match corporate or theme colors.